This model from LG is the new Ultra HD TV model that is surprisingly thin as well as light weight considering its dimensional size. It is a Smart TV, and it boasts 4K resolution meaning it ensures the UHD in the screen display. Therefore, whether you are watching movies, playing video games, or browsing on the internet, you will be provided with amazing clarity in the images which are displayed on this screen. 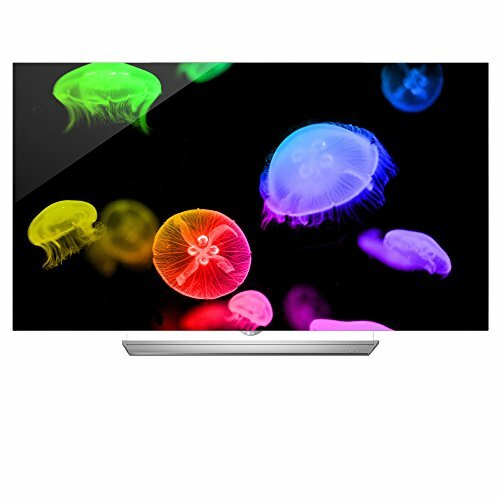 The LG Electronics 55EF9500 is one of a few OLED screen TV models which were released this year. This is an innovative television that boasts a sophisticated screen display which makes regular High Definition televisions pale in comparison, thanks to its OLED 4K resolution technology which is able to display HDR. Not only that its screen display is outstanding, but also its physical aspects, which contribute to this model’s modernity. So, if you can spend about $3000 and are in the market for an amazing 4K UHD Smart OLED TV, you should most definitely consider this model. It won’t disappoint you in any way. Until now, LG’s amazing OLED technology was pretty much limited to curved-screen televisions. Now this spectacular 55-incher provides an unbeatable combination – OLED technology and 4K Ultra High Definition. Ultra HD has 4x the picture detail of 1080p HD, so it ensures more depth, realism, and detail. And TV experts agree that OLED’s superb black levels and contrast help it provide the best picture quality yet. In case you are not familiar with this technology, OLED is currently the most advanced screen technology available. OLED (Organic Light Emitting Diode) technology is really amazing, and the key to this technology is the screen material which is an organic substance which glows when an electric current activates it. The pixel layer of the screen is made of this carbon-based, self-illuminating material – each pixel is actually its own light source that can be independently switched off and on, therefore there is no need for a backlight. Moreover, in comparison to regular types of displays, OLED doesn’t have so many layers between the screen’s pixels and your eyes, and this is a major reason why OLED images have such breathtaking clarity, color, and immediacy. Over the last two years, LG has really put some effort into speeding their Smart TV function with their first WebOS, and their current WebOS 2.0. Booth up times are much faster, but the new Android TV platform is still faster than the LG WebOS 2.0. The interface layout is more intuitive and simpler. Not just that, the amazing new LG Magic Remote makes sorting all your favorite programs extremely easy thanks to the Remote’s point and click operation. This remote is fun and simple to use. You can even speak into this Magic Remote in order to find precisely what you’re looking for, searching across movies, applications, web, and TV shows, all at the same time. The built-in web applications on the LG Electronics 55EF9500 provide you with instant access to a wide selection of entertainment. This TV is a Netflix Recommended TV meaning you’ll get faster and easier access to Netflix, with faster playback as well as start times.